Over the next few months, Gamestop will be distributing three special PokÃ©mon: Shiny versions of the legendary Giratina, Dialga and Palkia. Gamestop and Nintendo have revealed plans to release a series of shiny, legendary PokÃ©mon totally gratis to anyone willing to brave the wilds of their local shopping center. According to Nintendo, come August 19, the shiny Dialga will be available for download at almost every Gamestop/EB Games location. 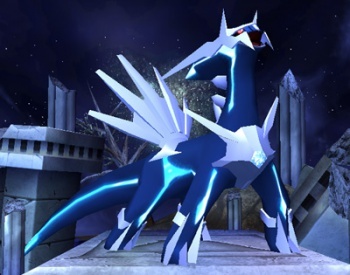 It will be available for three weeks, then on September 9 the Dialga will be replaced by a shiny Palkia. Three weeks later, on September 30, Giratina appears. Those of you who keep up on your PokÃ©mon lore should already be aware that those three 'mon stand as huge figures in the PokÃ©mon universe. Without getting into the full backstory, you can consider these three to be analogous to deities. Dialga represents time, Palkia represents space, and Giratina is some kind of horrible nightmare dragon thing. Point being: They're very desirable PokÃ©mon. As for that "shiny" notation, it's a relatively little-known feature of the PokÃ©mon games that basically boils down to, "you got incredibly lucky and picked up a hyper-rare, specially-colored version of this pocket monster." During normal gameplay, when encountering any given PokÃ©mon, the odds of it being shiny are roughly 1 in 8,192, so you can see why such 'mon are so in-demand. Now that your interest is piqued, all you need do to pick up your new PokÃ©pals is visit a Gamestop store during the period of time outlined above. Assuming you own PokÃ©mon Black, PokÃ©mon White or either of their sequels, you should be able to download the applicable PokÃ©mon to your 3DS or DS handheld. What you do from there is in your hands, though I'd suggest humiliating the Elite Four repeatedly. Those pompous jerks have it coming.